Click here to buy the paperback book. Click here to buy the audiobook. Go! is for everyone who knows they were created for something more, but they’re not sure exactly what that is, or how to get it. It helps you answer the important questions: What’s your purpose? What difference do you want to make in the world? What do you really want to do with your life? Who do you want to become? Can you really live the life you’ve dreamed of? When you discover your Passionate Purpose you develop clarity about what’s most important to you and why. This creates more energy for you to pursue those things and generates more success in every aspect of your life. The principles in this book led Greg Knapp to become a mental health counselor, to a career in radio where he became the host of a nationally syndicated show in just nine years, and to help others live out their dreams. In Go! you get the best of Greg’s two decades of research. You will learn how to find your true calling and then how to take the daily steps necessary to experience your best life. With stories, examples, and proven techniques Greg gives you the tools to stop thinking about it and start doing it. He helps you Go! Free Action Pages for GO! 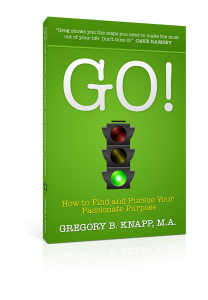 Click on the image for worksheets to help you find and pursue your Passionate Purpose. Good luck, and GO! Thanks a ton. Glad you liked the book. I hope the worksheets and the exercises help you. Let me know if I can help in any way.